While expertly directed by Tim Wardle, Three Identical Strangers reminded me of Catfish, the 2010 film that was later turned into a successful MTV reality show about online anonymity. Both films featured an unbelievable true story, and they’re both mysteries in their own right. But, both films were also gifted with a deceiving albeit intriguing marketing campaign. Through its promotional materials, Catfish was given the perception of a horror movie as its filmmakers used hands-on researching skills to uncover someone’s true identity. The finished film, while tense, was sad and more poignant than anyone could’ve been prepared for. The same goes with Wardle’s Three Identical Strangers. Initially, the film is pitched to movie goers as a stranger-than-fiction tale of three adult brothers reuniting through coincidences, which seemingly leads to an outrageous reveal as to why they were separated as kids. However, as the film becomes less romanticizing and more honest, the audience is affected and shaken by the heartless activities that led up to this grand reveal. There you are, anxiously waiting for this review to get to the point. It’s tremendously difficult to expand on Three Identical Strangers without delving into spoilers, which I won’t do here. It’s a film that is best appreciated with an empty slate and an open mind. 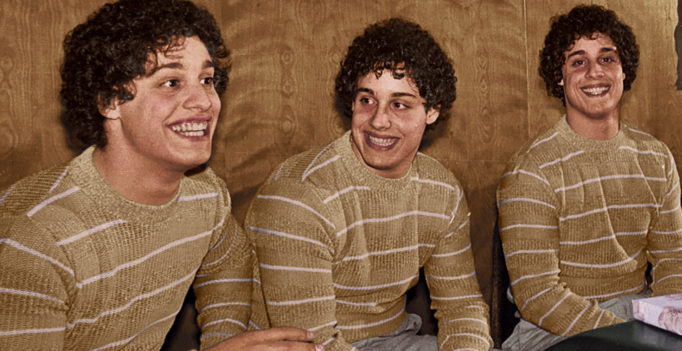 I’ve watched Three Identical Strangers twice now: once at this year’s Hot Docs Canadian International Film Festival and again preceding its Canadian theatrical release. While I enjoyed the film the first time, I was left feeling distraught; having not been prepared for the doc’s psychological depth. On a second go, not only was I emotionally prepared, but I was astounded by how Three Identical Strangers was just as fresh and surprising, also leaving me impressed by its ingenious use of archival footage, intimate interviews, and reenactments. One last thing: Three Identical Strangers is also similar to Catfish in a more personal way. Just as I named Catfish as the cream of the crop for its year, Three Identical Strangers is, also, one of the best documentaries you’ll see this year.